The IUPAC Compendium of Chemical Technology, better known as the Gold Book, has been an essential tool for chemists since it was first published more than 30 years ago. In the digital age it is being reshaped to be even more useful. On January 24, ACS hosted a webinar featuring Dr. Stuart Chalk discussing the ongoing work to update the Gold Book’s website and repurpose it for modern research. Chalk, an Associate Professor of Chemistry at the University of North Florida, is leading the redevelopment of the IUPAC Gold Book website and is a titular member of IUPAC Committee on Publications and Chemical Data Standards. The Gold Book was initiated by Victor Gold in the early 1980s. It originally existed solely as a physical document, and later a PDF and an XML file. It wasn’t until 2006 that the Gold Book existed on a website. That website was updated and expanded several times over the years, most recently in 2014. 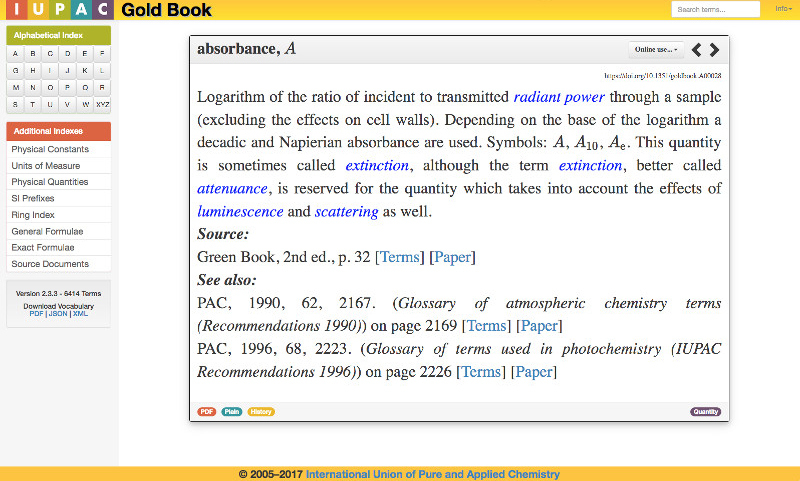 Each term had its own page, which contains a definition, source listing, further references, a related index, and a digital object identifier. There were some 7,000 definitions on the site. In October 2016, it was discovered that more than 4,000 files on the Gold Book site had gone missing. Chalk got involved with the site, proposing an IUPAC project to backup, run maintenance on, and redevelop the Gold Book site. Chalk was unable to determine why the files had gone missing, but was able to replace them in November 2016, thanks to the Wayback Machine internet archive site, which had archived all of the pages on the Gold Book site. Soon after, the site was migrated to a new server and backed up. Work began on converting pages to HTML5, cleaning up unnecessary code, updating links and working on the new site. The project task group began work on the new site with “scraping” data from the term pages and other associated files with PHP script commands and moving them to a database. The new site has definition pages created from the database, which reduced the number of HTML files associated with the site, Chalk said. “An important part in coming up with this new layout for the website was understanding what the data was available from the old site, how the pages were linked together, and how we might make that more appropriate for the current technology,” he said. Using more modern coding, the new site was made to be accessible on different platforms. The pages resize for appropriate viewing on computers, tablets and phones. The site is more accessible for computers, too. A user can now export data from Gold Book in different formats, and terms are available for other scientific disciplines to use them in any online applications. Work on the new Gold Book site isn’t quite finished, but Chalk and the rest of the team already have improvements lined up. He and others working on the site see the need to implement a system to update terms in the Gold Book. Chalk said he also wants to link terms back to the original PAC articles, rather than the color books. Chalk and others believe that one day the Gold Book could be turned into a chemical ontology. He suggested that the ontology could be further built out from terms recommended by the IUPAC. 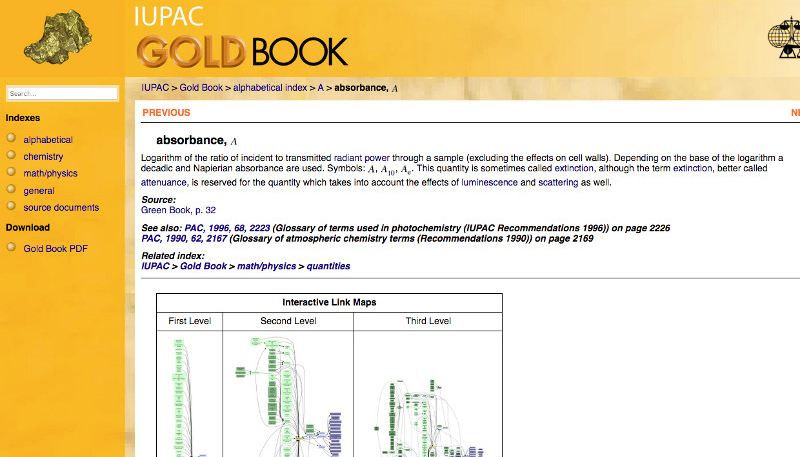 The Gold Book site could also have expanded uses, such as “big data” in chemistry, annotating chemical safety data, and annotating non-chemical knowledge. Chalk said the Gold Book could also be used to help students and ensure textbook accuracy. A multilingual Gold Book could be possible, which would expand its use to non-native English speakers and ensure accurate interpretation. It could be made more accessible to those with disabilities, as well. “The re-engineering the content of the IUPAC Gold Book opens the knowledge to digital applications, better supports the chemistry community, and highlights the importance of the chemistry community,” Chalk said.